The increase in atmospheric CO2 presents a second major change for reef-building corals and other marine calcifiers. Nearly half of the CO2 that enters the atmosphere is absorbed by the ocean, where it reacts with water to form carbonic acid (Equation 1). Carbonic acid dissociates into bicarbonate and a proton (Equation 2). The protons released by the entry of CO2 into seawater then react with carbonate ions to form additional bicarbonate ions (Equation 3). The problem is that relatively small rises of CO2 in the atmosphere at the pH range of seawater will cause a large decrease in the concentration of carbonate ions. 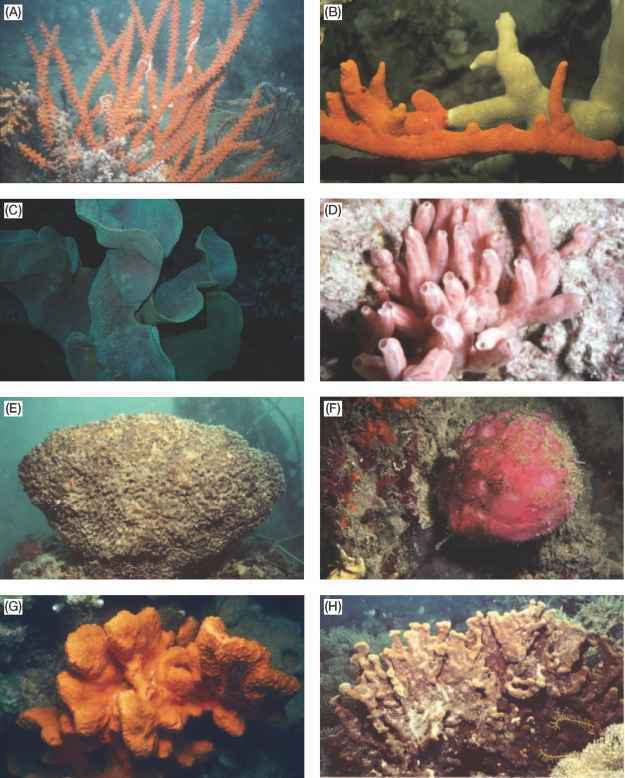 Figure 10.4 Examples of diseases reported on Great Barrier Reef corals. 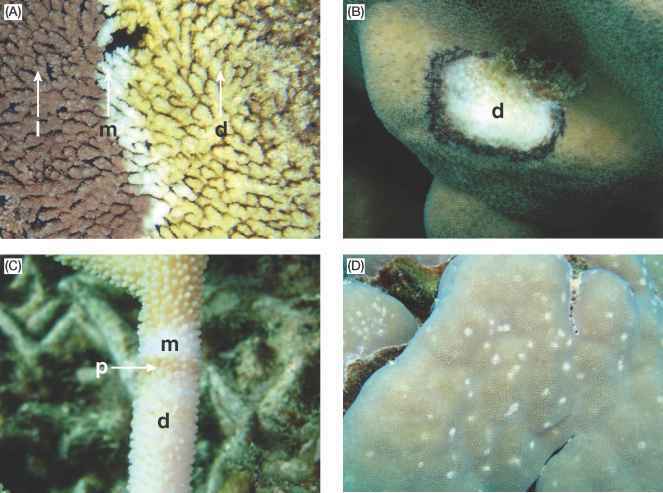 A, White Syndrome on tabulate Acropora (photo: G. Roff); B, Black Band Disease affecting Pavona sp. (photo: G. Roff); C, Brown Band Disease on a branching Acropora (photo: O. Hoegh-Guldberg) and D, White Spot syndrome on Porites (photo: O. Hoegh-Guldberg). i, living tissue; m, advancing margin of disease; d, dead exposed coral skeleton; p, concentrations of ciliates. 450-500 ppm if reef calcification (calcification minus erosion) is to remain positive against the forces of physical and biological erosion. Given that there is growing evidence that erosion (particularly bioerosion) is likely to increase under atmospheric CO2, these thresholds become even more real (see Chapter 8).